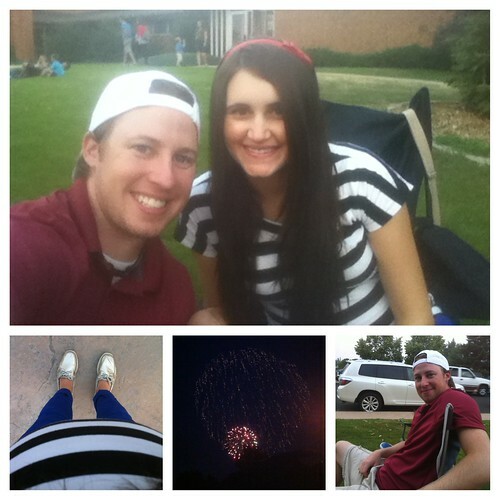 Our 4th of July was splendid. Kevin woke up to golf with some guys from church at a 6:15 am tee time at Marianna Butte. He played 18 holes while I slept in. And since we are lame we didn't plan anything else for the afternoon. Kevin took a nap and I went and worked out. Then because of all of the Colorado wild fires (High Park Fire was 15 miles away from us! And this has been on my 'To Blog' list for awhile...anyways, I'll get there) there was a statewide fire ban and still is. However, professional firework shows can get permission from the city to do their own show. Fort Collins show was cancelled so we went to Loveland's (15 min. away). 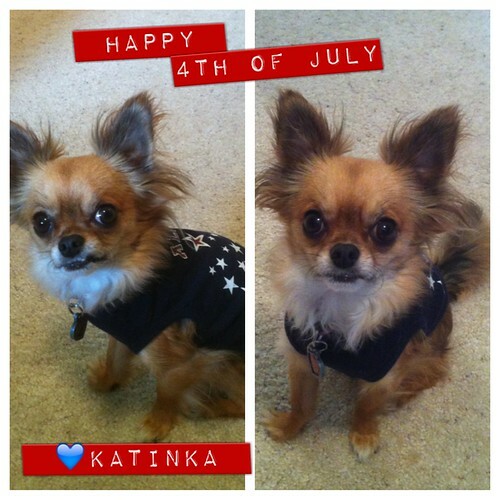 Here is Katinka wishing everyone a Happy 4th of July! Yes, she wasn't too thrilled to wear this but I was super excited since whenever I see this outfit I think, "I need to put her in that for the 4th of July!" I never have but I finally did this year, so props to me. And yes her lip in the left photo is stuck on her tooth so she has a nice snarl. 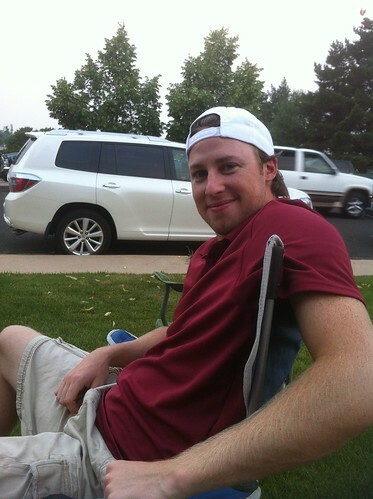 Kevin and I went to our church's old stake center in Loveland (We are in the Loveland Stake) to save seats for the firework show while my parents picked up some KFC. I honestly haven't been in Colorado for the 4th of July in forever! Recently, the last few years for July 4th, we were in Kansas City and a couple we were on trips (and on a cruise) so I've missed it. I remember seeing the Loveland show here at the stake center when I was younger. And when I was clogging growing up, we always performed at 4th of July events! Actually, we performed everywhere publicly you possibly can - no lie haha. Kevin chillin and we were getting hungry. This lighting was horrible but here is our photo for the night lol. We saw a TON of people from the church here! It is a hidden secret of where to sit for the show that mostly members know about. My parents came and brought the KFC. I've never been a HUGE fan of KFC but 1. I am pregnant, 2. I was mad hungry. and 3. When the food came, I scarfed it down like nobodies business. Like I always ate a few bites of the drumsticks in the past, but I was eating the weird funky pieces no problem. I even ate the mac n cheese that Kevin said was gnarly lol. And here is my red/white/blue attempt. Happy Belated 4th of July America! PS. 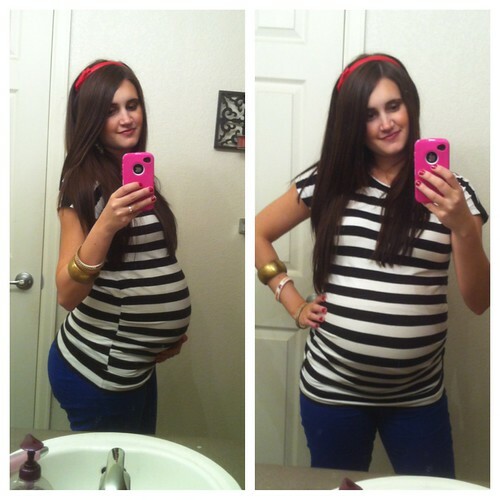 I was 32 weeks pregnant here. Totally digging your bright blue pants!